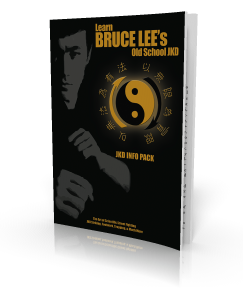 Taken from; “Chinese Gung Fu” The Philosophical Art of Self-Defense by Bruce LeeThe basic structure of Gung Fu is based on the theory of Yin/Yang, a pair of mutually complementary forces that act continuously, without cessation, in this universe. This Chinese way of life can be applied to anything, but here we are interested in its relationship to the art of Gung Fu. the black part of the circle is called Yin. Yin can represent anything in the universe as: negativeness, passiveness, gentleness, insubstantiality, femalness, moon, darkness, night, etc. The other complementary part of the circle is Yang, which represent positiveness, activeness, firmness, substantiality, maleness, sun, brightness, day, etc. The common mistake most people make is to identify this Yin/Yang symbol, T’ai-Chi, as dualistic; that is Yang being the opposite of Yin, and vice versa. As long as we separate this “oneness” into two, we won’t achieve realization. Actually, all things have their complementary part; it is only in the human mind and his perception that they are being separated into opposites. The sun is not the opposite of the moon, as they complement and are interdependent on each other, and we cannot survive without either of them. In a similar way, a male is but the complement of the female; for without the male, how on earth do we know there is female, or vice versa. The “oneness” of Yin/Yang is necessary in life. If a persona riding a bicycle wishes to go somewhere, he cannot pump on both the pedals at the same time or not pumping on them at all. In order to move forward, he has to pump one pedal and release the other. So the movement of going forward requires this “oneness” of pumping and releasing. Pumping then is the result of releasing, and vice versa; each being the cause of the other. In the Yin/Yang symbol there is a white spot on the black part, and black spot on the white one. This is to illustrate the balance in life, for nothing can survive long by going to either extremes, be it negativeness or positiveness. Therefore, firmness must be concealed in gentleness, and gentleness firmness, and that is why a Gung Fu man must be pliable as spring. Notice that the stiffest tree is most easily cracked, while the bamboo or will bend with the wind. So in Gung Fu, or any other system, one must be gentle yet not giving away completely; be firm yet not hard, and even if he is strong, he should guard it with softness and tenderness. For if there is no softness in firmness, he is not strong; in a similar way, if one has firmness concealed in softness, no one can break through his defense. This principle of moderation provides a best means of preserving oneself, for since we accept this existence of the oneness (Yin/Yang) in everything, and do not teat it dualistically, we thus secure a state of tranquility by remaining detached and not inclining to either extreme. Even if we do incline on one extreme, be it negative or positive, we will flow with it in order to control it. This flowing with it without clinging is the true way to get rid of it. When the movements in Yin/Yang flow into extremes, reaction sets in. For when Yang goes to the extreme, it changes to Yin; and when Yin (activated by Yang) goes to the extreme, it returns back to Yang (that is why each one is the result and cause of the other.) For example, when one works to the extreme, he becomes tired and has to rest (from Yang to Yin). This incessant changing of Yin/Yang is always continuous. The application of the theory of Yin/Yang in Gung fu is known as the Law of Harmony, in which one should be in harmony with, and not against the force of the opponent. Suppose A applies strength on B, B shouldn’t oppose or gives way completely to it. For these are but the two extreme opposites of B’s reaction. Instead, he should complete A’s force, with a lesser force, and lead him to the direction of his own movement. As the butcher preserves his knife by cutting along the bone and not against it, a Gung Fun man preserves himself by following the movement of his opponent without opposition or even striving (Wu-Wai, spontaneous, or spirit action). This spontaneous assisting or A’s movement as he aims it will result in his own defeat. When a Gung fu man finally understood the theory of Yin/Yang, he no longer “fusses” with so-called “gentleness” or “firmness”; he simply does what the movement requires him to do. In fact, all conventional forms and techniques are all gone, his movements are those of everyday movements. He doesn’t have to “justify” himself like so many other masters have, claiming his spirit or his internal power; to him, cultivation of martial art in the long run will return to simplicity, and only people of half-way cultivation justify and brag about themselves. 40th Anniversary of ‘Enter The Dragon’, ‘No Way As Way’ Documentary & More!